Watching birds zip across the sky is a breathtaking experience – However, how fast can some birds of prey go – and how do they do it? Let’s look at the five fastest birds of prey. Wing shape is a major factor in how fast a bird can fly – and not all wing shapes are created equal.The long, thin, pointy wings that are perfect for high-speed flight aren’t well-suited to soaring on thermals, hovering, or maintaining a high constant speed. because of speed isn’t always the number one goal of a given bird species, many bird species evolved to have other wing shapes that are well-suited to their niche. There are many incredibly fast birds out there. The White Throated Needletail, a tiny swift from the mountains of Asia, clocks speeds of up to 105 miles per hour – the fastest flapping speed of any bird out there. Frigatebirds, albatrosses, and other seabirds can also hit nearly 100 miles per hour when they catch the right wind currents. But today, we’re almost focusing on birds of prey – and that means we’re primarily looking at the diving speeds of these formidable predators. About: This bird lives primarily along mountain ranges and river valleys, though the species is also adapting to thrive in cities. There are several subspecies with a range of sizes. They hunt other birds, sometimes as large as ducks. They are highly prized in falconry thanks to their exciting stoop (dive) and the relative ease with which they can be trained . Measuring the top speed of 389km/h took some seriously cool bird training and a Cessna plane – read about that here. Native to: Most of the Northern Hemisphere, including Eurasia, North America, and northern Africa. Native to: Arctic coast and tundra, including northern islands in North America, Europe, and Asia. Adults sometimes are found further south in the winter. About: The gyrfalcon is the largest falcon species. They hunt ptarmigan and waterfowl. Hybrids between the gyrfalcon and peregrine falcons are commonly used for falconry, as the larger size allows falconers to hunt more quarry. 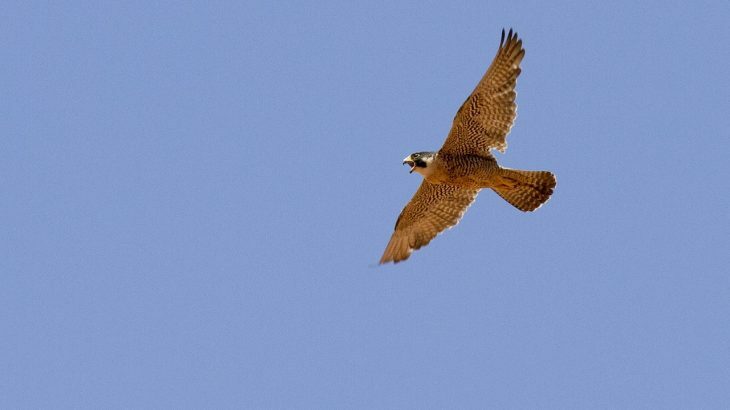 About: This bird thrives in open grassland and is fast enough to catch swallows and swifts mid-flight. It prefers to hunt around dawn and dusk. They are astonishingly agile, and part of their courtship ritual involves passing off food at high speeds. Flight speed is just one of many ways that birds can gain a competitive – and evolutionary – advantage. While most fast birds of prey primarily use their speed to capture prey, some also use their speed to harass rivals or get away from even bigger predators!